Five-bedroomed Villa Portakal and its stunning location overlooking Kalkan Bay on Turkey's turquoise coast are sure to charm. Perfect for a family-friendly holiday. 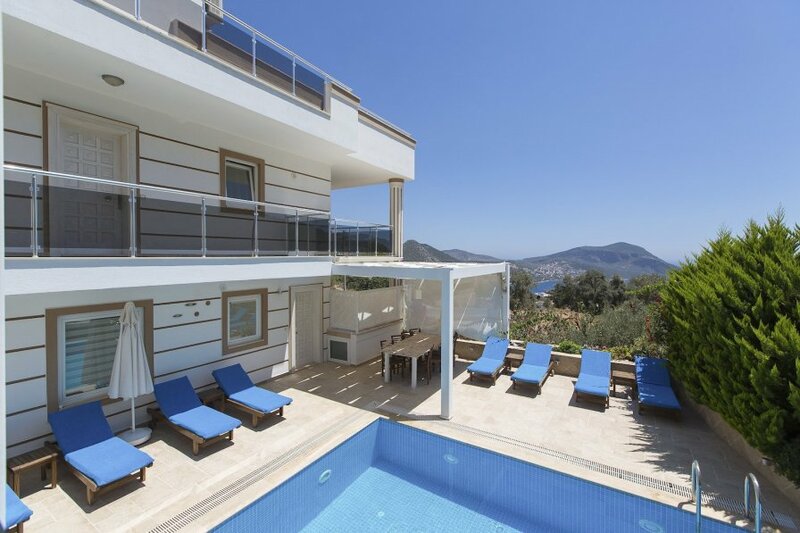 Five-bedroomed Villa Portakal and its stunning location overlooking Kalkan Bay on Turkey's turquoise coast are sure to charm. Perfect for a family-friendly holiday, the villa can sleep up to twelve guests across its two spacious floors, and has its own private outdoor swimming pool – as soon as you arrive you'll want to kick off your flip-flops and dive in! Inside, the interiors are fresh and light with playful pops of colour in the soft furnishings that create a warm and homely feel. The villa is split over two separate buildings. The main house has two floors and boasts a glorious open-plan living and dining room with full-length windows allowing you to fully appreciate the views and allow light to flood the room. There's also a fully-equipped kitchen, two double en-suite bedrooms and a twin room. The annexe – on the other side of the private swimming pool – boasts its own lounge with a sofa bed, kitchen, double en-suite bedroom, twin bedroom and family bathroom. It's ideal for a group of friends or a large family looking for a bit of extra privacy. Outside, the luxurious private swimming pool and lounger-lined terrace grab your attention. Enjoy days relaxing around the pool or snoozing in one of the swing seats. By evening, dine al fresco on the outdoor dining area while watching the sunset over the coastline or survey the landscape from new heights on the second terrace with table, barbeque and ottoman seating corner under pretty bougainvillaea flowers. The location of Villa Portakal means that although you are in a private and quiet spot, Kalkan town with its beach, famous roof-top restaurants and bars and shops is only a short 10-15-minute walk away, and popular Patara Beach is a short 20-minute drive. Villa Portakal is in central Kalkan; a historic fishing village turned popular holiday destination on Turkey's turquoise coast. The harbourside town is surrounded by beautiful tree-lined hills that look down on the glistening bay. Head to the photo-worthy harbour dotted with colourful boats or wander the cobbled old streets lined with pretty boutiques and classic whitewashed houses. Kalkan is an excellent place for shopping with a range of shops and bustling markets where you'll find everything from spices to hand-made rugs, produce and jewellery. Look out for stalls selling fresh golmeze (traditional savoury pancakes). Stop off for a drink and bite to eat at one of the waterfront cafes or roof-top restaurants, offering fantastic food and unrivalled views of the bay. Kalkan is also famous for its proximity to Lycian ruins – interesting ancient sites – or its many local activities. Apart from sandy Kalkan beach near the marina, and Kaputas, a scenic cove about 7km east of Kalkan, there's also Patara beach which is also a national park. Most of the beaches in and around Kalkan have beach day clubs which offer adrenaline-pumped sports like sea kayaking, scuba diving and parasailing, and also have decking for sunbathing and restaurant facilities. For fun day trips further afield, drive about 30 minutes to the cosmopolitan town of Kas. There you'll find the impressive ancient site of Antiphellos, with still-visible ruins including a theatre. You can also jump on a boat from Kas to the island of Kekova where there are mysterious half-submerged ancient 2nd-century ruins. Discover them via swimming, snorkelling or sea kayaking. For things to do closer to home, boat trips from Kalkan harbour to the surrounding bays and coves are well worth it. Culture fiends will love the ancient sites of Xanthos, Patara and Myra, while nature lovers can rejoice in the fantastic walking, biking and hiking routes in the olive groves and foothills of the mountains.